Return of the John P. Health Challenge - Begins Jan. 1, 2010! Home / Health & Fitness / Return of the John P. Health Challenge – Begins Jan. 1, 2010! Return of the John P. Health Challenge – Begins Jan. 1, 2010! December 12, 2009 By John P.
Back in April I shared my plans for a diet and exercise routine that I called the John P. Health Challenge. 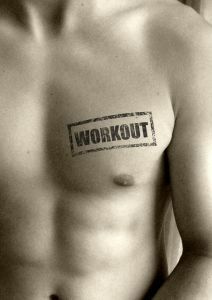 This was all about getting myself in better shape, and letting everyone know in case they wanted to join in. At the time over 100 people decided they wanted to get in better shape too, and we all had a great time encouraging one another to do so. Well, the John P. Health Challenge is back! And guess what? It’s just in time for everyone to make it a New Year’s resolution. So that means you can be gluttonous for the holidays, but come January 1, 2010 we are ALL going to get in shape together! And this time, we are going to do things a little differently. There are going to be weekly prizes for our participants, and guest judges to hand them out. Stay tuned for all the details as we get a little closer, but in the meantime mark your calendars and start spreading the word NOW! By the way, if you Tweet about it or put it on Facebook, please use the #GetHealthy hashtag so we can all track it and follow along! Definately will sign up , how do I sign up? Count me in, too – started today. Slow start, since I’ve been so freaking naughty! And since I have a broken toe/foot. But I’m game!!! Count me in, already started.. seeing yourself on video can be a good source of motivation, it’s way worse than the mirror! Thank God, the challenge is back, I need to shed a few love handles.